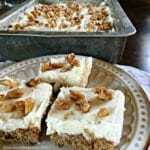 I don’t know of a better way to get your veggies than in these scrumptious Carrot Cake Bars with Cream Cheese Frosting. Simple and delicious! 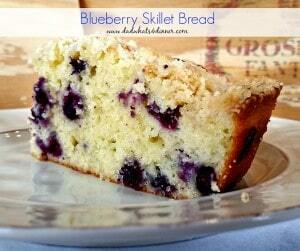 So I have made many different bar and cake recipes over the years. One of my favorite ingredients is carrots. They always add such a nice flavor and texture especially when paired with raisins and nuts. I love using fresh vegetables in the summer to make desserts like my zucchini bars and my Blueberry Sour Cream Skillet Bread. My kids are starting school next week and I will make a batch of these Carrot Cake Bars for the start of the year teachers luncheon. I guess I should also make a batch for the kids so they have a nice snack when they get home from school after a hard first day. 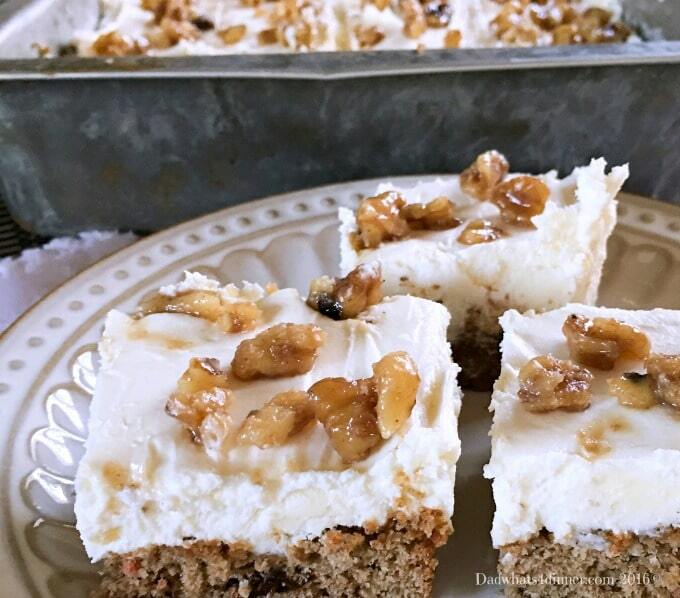 What is your favorite dessert bar recipe? In a large bowl, mix your carrot cake mix, vegetable oil, and eggs until all the ingredients are combined. Fold in raisins and 2/3 cup nuts. Spread the dough evenly into a sprayed 9x13 inch pan. Flatten the top. Bake for 18-20 minutes or until a toothpick inserted comes out clean. Beat the butter and cream cheese until nice and fluffy. Beat until smooth and no visible chunks of cream cheese remain. Spread on top of the cooled cake bars. 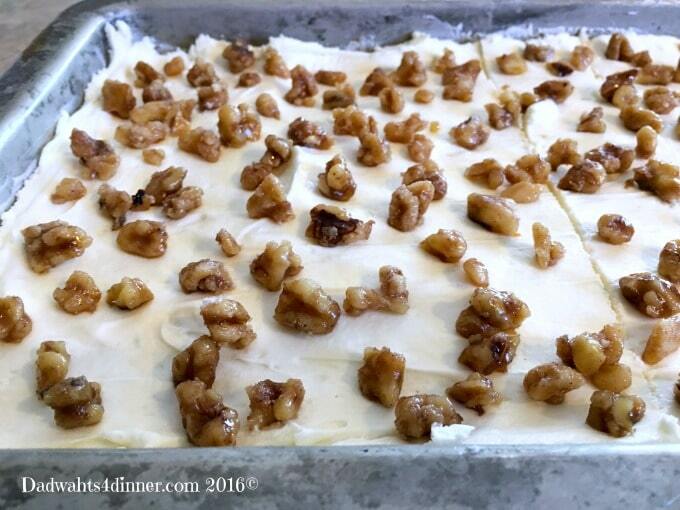 Sprinkle your chopped nuts over the top and serve or refrigerate for a few hours to allow frosting and bars to set up. Store bars in an airtight container, in the refrigerator. I like the idea of this being a way of getting my daily veggies. Gosh where did that summer go? 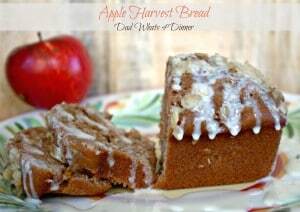 I love carrot cake and it’s my son’s favorite too. These bars look delicious! 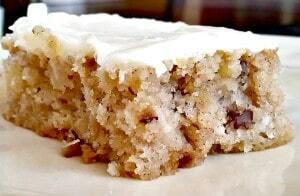 I have never (never, ever) turned down carrot cake anything and your carrot cake bars are taunting me! They look amazingly good. I LOVE that you haven’t skimped on the cream cheese icing either! I fear I could eat a half dozen squares with no effort at all. Thanks for sharing them at this week’s Fiesta Friday party… I’m sure they’ll be a hit! Thanks Nancy. They are pretty good. Have a great weekend and Happy FF! 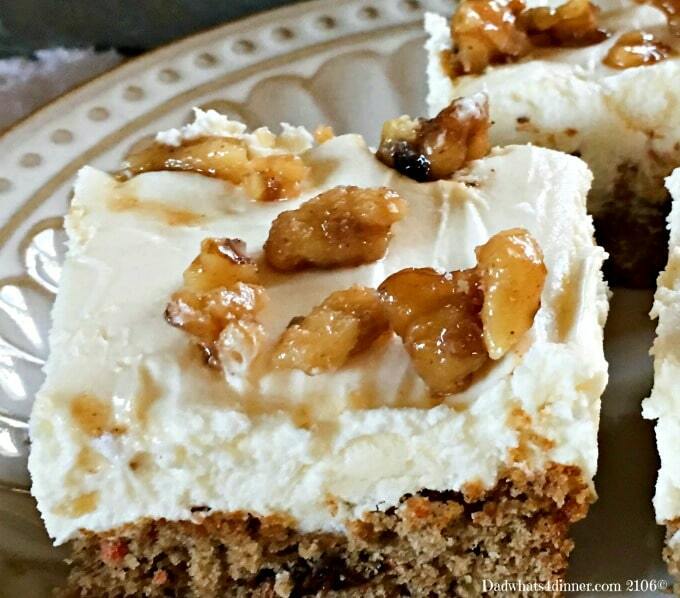 Carrot is a great ingredient in cake and that frosting looks divine! 🙂 Happy FF! These bars look so tasty! Thanks for linkin’ up with What’s Cookin’ Wednesday!